Travelers everywhere now expect their online experiences to be as frictionless on mobile as they are on desktop. However, the online travel and hospitality industry stands out for often failing to meet that expectation. So, how can you ensure your hotel is optimizing for today’s mobile-connected travelers at every stage of their hotel booking journey? Read on as we take a step-by-step look at each stage of the booking journey, with practical tips on how to optimize your hotel website, booking process, and guest experience for the ultimate mobile customer journey. Mobile users are often in the planning stage of their hotel stay. A study from Google showed that 87% of the “digital moments” related to planning a holiday occur on mobile. The first step to reaching travelers using mobile devices is to ensure your hotel website is mobile optimized. The key aspects to focus on are speed, ease of use, and compelling content. Your site should be lightweight enough to load quickly even over slower mobile connections. One practical tip to achieve this is to make sure the dimensions of images of your property are no bigger than how they are displayed on your website. Also ensure that the files are properly compressed for optimal quality and size. Remember that mobile visitors are navigating your hotel website on a small screen using just their fingers. An easy-to-use site is one with large, finger-friendly click targets, such as buttons, links, and form fields. Additionally, make often-accessed information, such as your telephone number and address, as easy to find on your mobile site as possible. Finally, make sure your mobile website showcases your hotel with stunning imagery, compelling reviews and recommendations, and detailed descriptions of your amenities and special offers. Travelers booking with mobile devices are more likely to be last-minute bookers compared to those on desktop. 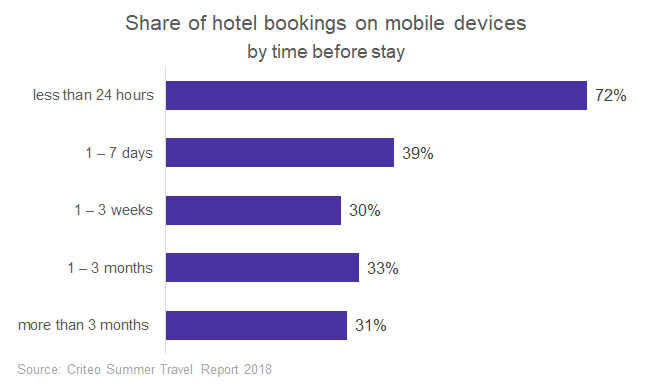 Data from Criteo shows that the shorter the time between booking and stay, the more likely that guests will book on mobile. In fact, more than 70% of same-day hotel bookings occur on mobile. Take advantage of this by using your hotel’s mobile website to target last-minute bookers with special deals and offers. To fully benefit from direct hotel bookings on mobile, your website will need a mobile-optimized booking engine. This should streamline the booking process so that it is fast and simple. In particular, it should reduce the hassle of entering data, which can often be a pain-point on mobile devices. Use a booking engine that ticks these boxes, such as the Booking Engine from Base7Booking. Facilitated bookings on metasearch are another option to create a seamless mobile experience for travelers. Services such as trivago Express Booking create a branded direct booking experience, but take place directly on the metasearch website or within the app. Metasearch sites have higher rates of mobile traffic, thanks to their mobile-friendly ability to compare many hotels on one site or within one app. By advertising your rates on metasearch, you could increase the share of direct mobile bookings to your hotel. Rate Connect enables you to publish your website rates on trivago. It uses a cost-per-click (CPC) campaign that brings the traveler straight to your website to complete their booking. Rate Connect makes running a CPC campaign simple and cost-effective, with no need for extensive knowledge or resources. It features an easy-to-use interface, the flexibility to set a competitive budget, and daily auto-optimizations for your bidding. Take the next leap to accommodate smartphone-loving guests by considering offering a customized hotel mobile app. This can enable your hotel’s guests to skip the check-in line and use their mobile phone as a room key. An app can also be used as the center of a smart hotel experience to control lighting, room temperature, and smart appliances. Even hotels without the resources to provide their own app can appeal to mobile-reliant guests. Offer free high-speed Wi-Fi to help keep guests connected and provide plentiful charging ports and power outlets to keep them powered up. Additionally, give your guests more options at check-out time by offering mobile payment services such as Apple Pay and Google Pay. Are there other ways you cater to mobile-connected travelers? We appreciate hearing from you, so don’t hesitate to let us know by commenting below.